The city of Philadelphia, which had been under Republican control in the 1940s, shifted in the 1950s toward reform Democrats, whose policies included community redevelopment. At the same time, city planners began to eye Eastwick as a place to relocate low-income black populations being displaced by development projects in North and West Philadelphia. Yet although planners described Eastwick as "open land," it actually constituted an integrated community of some 19,000, the majority of whom owned their homes. Unsurprisingly, the plan faced opposition. But it nevertheless went forward. In 1958, Eastwick was declared the largest urban renewal project in the country, with the Korman Company making plans to replace the allegedly "poorly maintained and blighted homes" with newer, suburban-style construction in the 1960s and 70s. As Guian A. McKee writes in his study of Eastwick, the new development came at the expense of the existing community. It thus produced a "tragic irony," seeing as its realization required "the destruction of the area's unique existing community," which was one of the few integrated neighborhoods in Philadelphia at the time. Designing the project was the Greek urban planner Constantinos Apostolou Doxiadis, mastermind of Islamabad, Riyadh, and Baghdad's Revolution City. In these cities, he had made a name for himself by integrating city and countryside in a way that he, and state officials, hoped would ease the transition of rural migrants to urban space. Put differently, Doxiadis's designs were seen as anti-communist. In Eastwick, Doxiadis's work took the form of row houses on cul-de-sac streets, with traffic funneled toward peripheral roads. The neighborhood was one of only three in Philadelphia that grew in population between 1970 and 1990. The John Heinz National Wildlife Refuge at Tinicum extends from Eastwick to Tinicum Township, Pennsylvania. 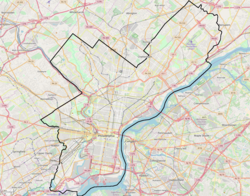 Eastwick contains a large industrial area where manufacturing and distributing uses take advantage of proximity to the Airport, Interstate 95, and Center City Philadelphia. There are many gas tank farms, oil refineries, and a sewage treatment plant. The area offers affordable land for industrial uses at reportedly "one-third the cost of outlying suburbs," while enabling companies to remain in the city where employees can utilize public transit. Eastwick is served by SEPTA Subway-Surface Route 36, which runs through the neighborhood and terminates at 80th Street–Eastwick station. This station is within walking distance of the Eastwick station on the SEPTA Regional Rail Airport Line; it is the only station on the line between the airport stations and University City station. Free Library of Philadelphia operates the Eastwick Branch, which serves Eastwick and other subdivisions, at 2581 Island Avenue. ^ a b McKee, Guian (July 2001). "Liberal Ends Through Illiberal Means: Race, Urban Renewal, and Community in the Eastwick Section of Philadelphia, 1949-1990". Journal of Urban History. 27: 563. ^ McKee, Guian (July 2001). "Liberal Ends through Illiberal Means: Race, Urban Renewal, and Community in the Eastwick Section of Philadelphia". Journal of Urban History. 27: 549. ^ McKee, Guian (July 2001). "Liberal Ends through Illiberal Means: Race, Urban Renewal, and Community in the Eastwick Section of Philadelphia, 1949-1990". Journal of Urban History. 27: 547. ^ Menoret, Pascal (2014). Joyriding in Riyadh. Cambridge, UK: Cambridge University Press. p. 69. ^ Weart, William (21 January 1962). "Big Project Open in Philadelphia". The New York Times. ^ Wallace, David (1998-02-01). "Commercial Property; Philadelphia's Airport Is a Hub of Development". The New York Times. Retrieved 2014-11-20.